Burger and Beyond’s story sounds like such a throwback from the past, that it’s almost quaint in its retro-ness. This burger stall, a stalwart of street food markets such as Street Feast’s Public Market in Woolwich, has now set up shop in the heart of Shoreditch with plans for two more branches in 2019. In our current era of vegan ascendancy and harsh economic times humbling once mighty burger chains, from Byron to GBK, it seems improbable that Burger and Beyond could offer jaded Londoners anything that they haven’t seen before. And yet Burger and Beyond not only shows that there’s still plenty of life left in the humble yet timeless burger, but that its kitchen can also rustle up other wonders. To the surprisingly pleasant dungeon! Despite their sloppy, almost dishevelled appearance, all of the burgers I tried managed to retain a remarkable level of structural integrity with minimal drippage and dribbling. Given that burgers are essentially glorified hot sandwiches, being able to eat one without staining your shirt is a vital quality often forgotten in the Instagram-fuelled quest for decadently oozy-looking burgers. 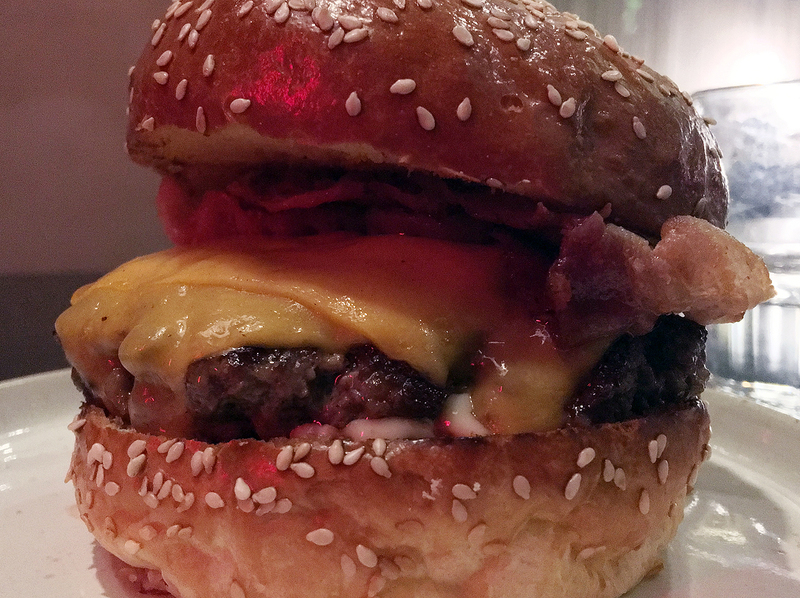 Burger & Beyond’s trademark BBB was as superlative as ever. The patty had a chewy, moderately coarse grind. Although allegedly cooked medium, its quivering moist pinkness looked medium rare to my eyes. Either way, its rich beefy tang was evident with hints of fattiness too. These qualities were complimented rather than overwhelmed, as they so often are in lesser burgers, by the modestly creamy cheese slices and the salty, smoky strips of fatty side bacon. The buns stayed out of the way, allowing every element of this sumptuous burger to shine. Available with either single or double patties. 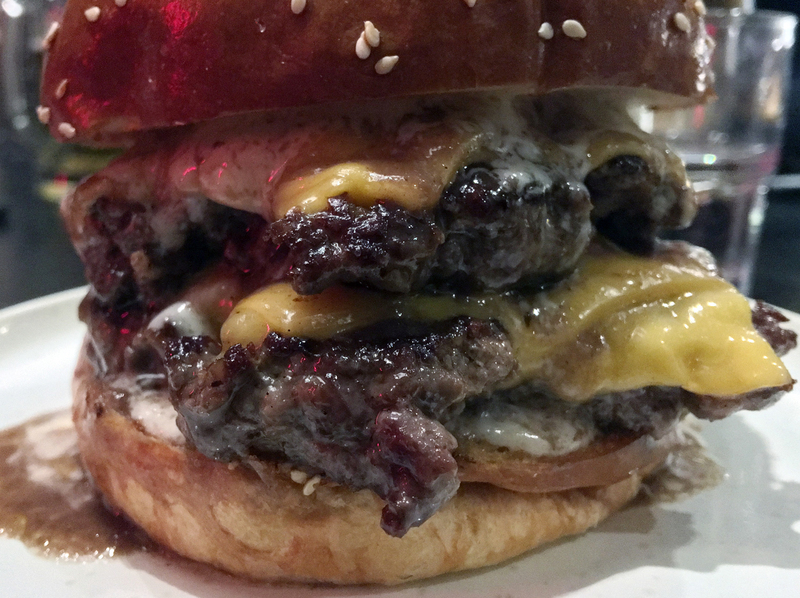 The Bougie burger was similarly well-balanced with the gently smoky cheese and sweet, precisely sweated onions working in step with the double patties, rather than against them. The patties weren’t an exact match for the one used in the BBB though, suggesting that there’s a person rather than just a machine or an assembly line toiling away in the kitchen. Smoother and more tender, it was different rather than better or worse. Regardless, it still had that addictive beefy tang which shone through with seemingly effortless grace. 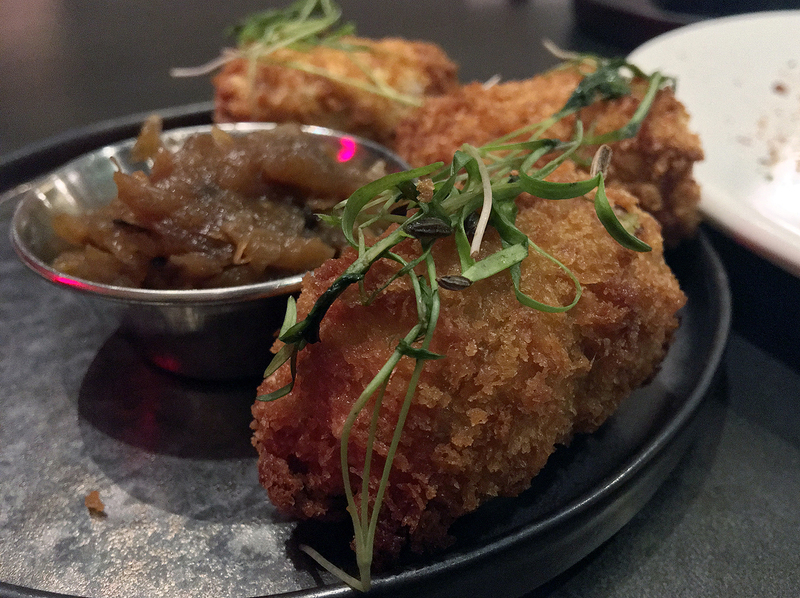 The poultry in the fried chicken burger had apparently been coated in a batter laced with Rice Krispies. That’s certainly believable given how perfectly crisp and crunchy the lightly sweet batter was – it was more uniform than a suited and booted marching band full of clones. While the drabness of the chook meat underneath wasn’t surprising, its touch of greasiness most certainly was. While the tart pickles and the crisp, refreshing coleslaw were pleasing enough in their own right, the blank canvas of the chicken needed something punchier and more characterful. 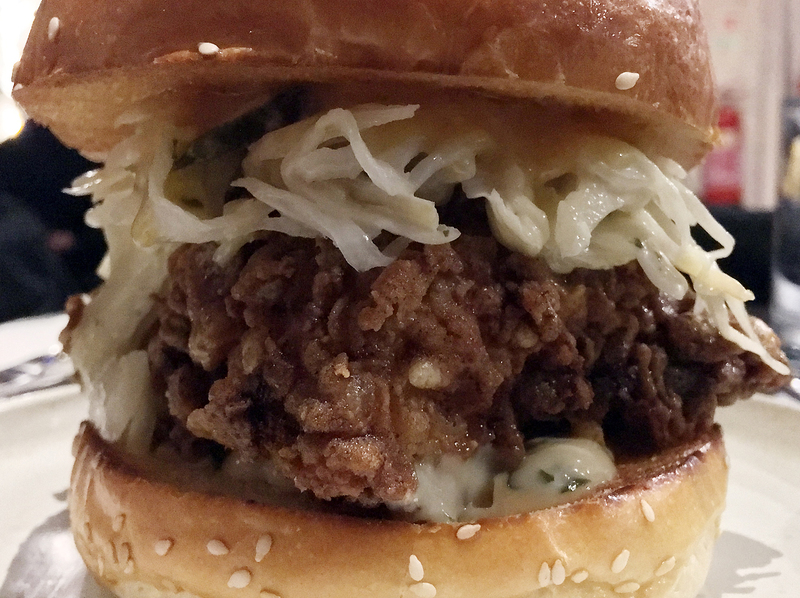 As it was, this chicken burger was ultimately more a triumph of texture than taste. The only vegetarian burger on the menu (unless you count the fish burger which I didn’t order) was based around a panko-crusted mushroom patty. Unlike most mushroom burgers, which use a single big-arse portobello mushroom, this one used a deep-fried patty made of minced fungi. The result was a tasteless, textureless void which wasn’t helped by the fine-grained batter which was more like an apologetically floppy fishcake than a crisp panko-flecked crunchfest. A creamily umami mix of raclette and onions along with crisp, sweet veg were too little, too late. I could feel the edginess emanating from the loudmouth at the next table. And that was before he put his phone on speaker to have a FaceTime video conference. 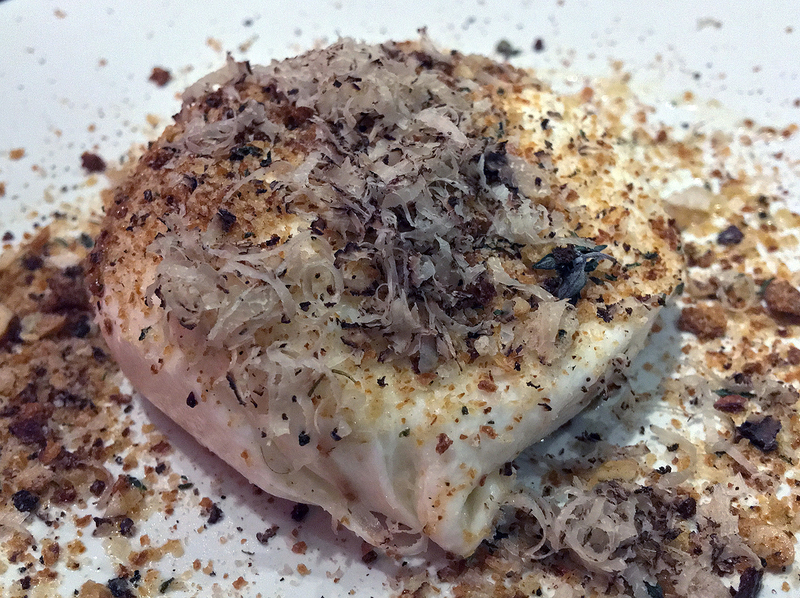 A better, if still flawed mushroom dish was a starter of fungi on sourdough, although the addition of lardo does rule it out for vegetarians. 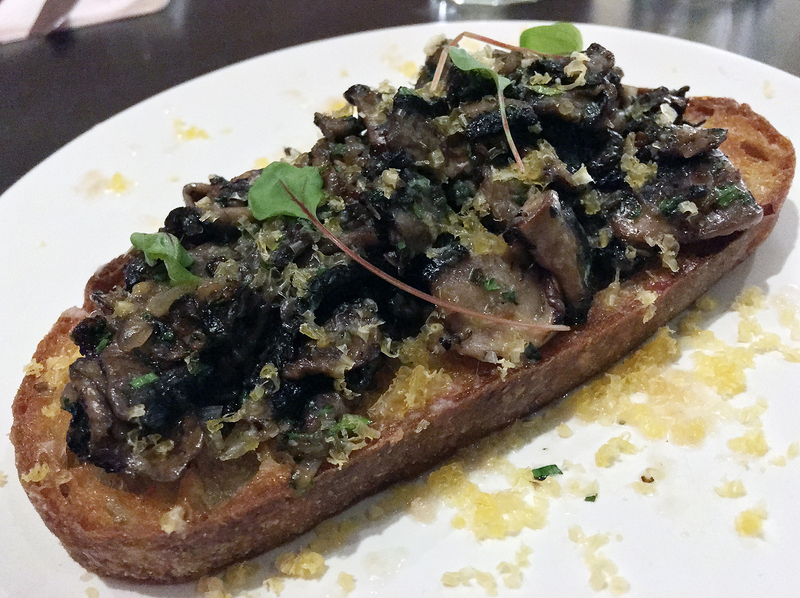 Although the mushrooms didn’t have much to say for themselves, the crunchy, chewy toast most certainly did with its slick of oinkingly rich butteriness. The dishes in this section basically put the ‘beyond’ into Burger and Beyond. 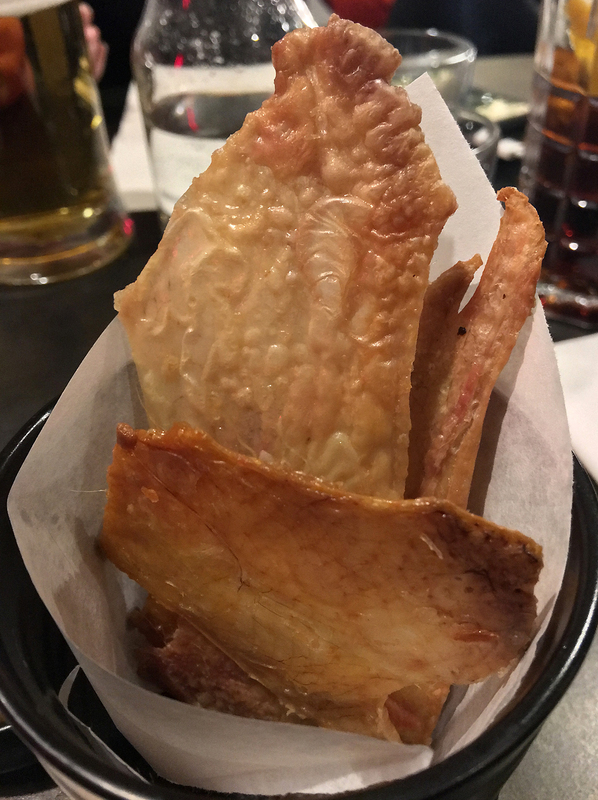 Spiced pork crackling was disappointingly tame on the spicing side, but was saved by its wondrously crisp and light texture. 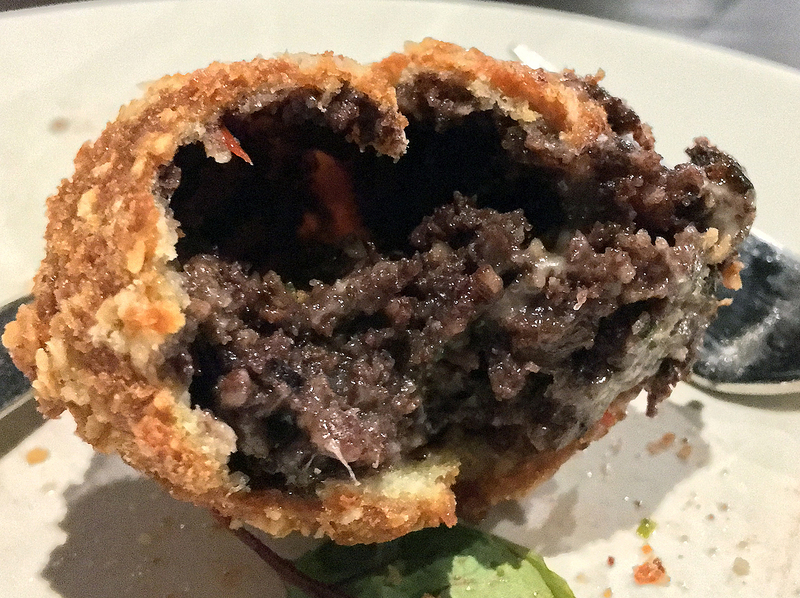 The best part of the black pudding croquettes had to be the firmness and fine-grained dimples of the scotch egg-style casing. The actual black pudding filling was surprisingly lacklustre, with little of the coarse salty earthiness of the very best black puddings. Even so, there was still much joy to be had by dunking that perfectly formed bread crumb shell in the tingly hot relish served on the side. To the moustachioed halfwit at the next table: Yes, East Germany was ‘the communist one’ out of the two. And Smokestak isn’t the best barbecue in town. A common mistake to make. 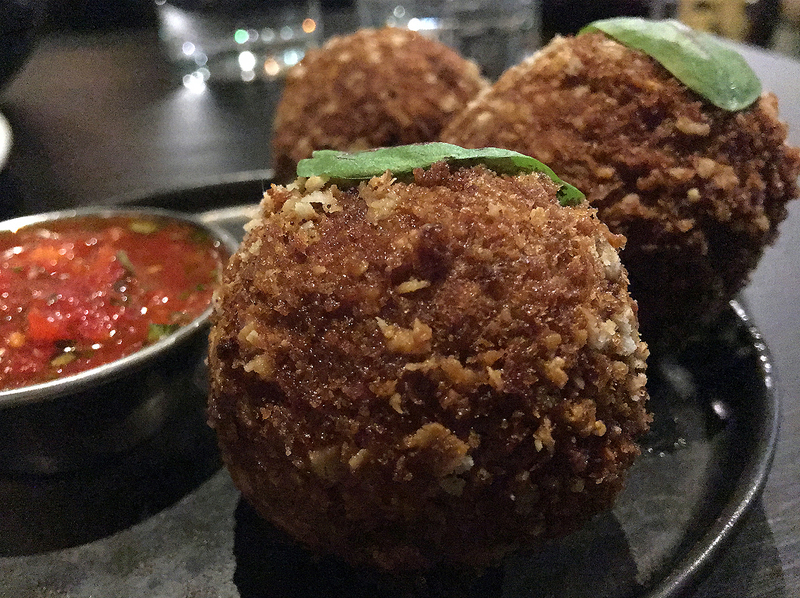 While the exterior of the lamb croquettes wasn’t quite as firm and well-formed as the black pudding croquettes’, the filling was more enjoyable. While only mildly earthy, the sinewy lamb filling was flecked with carrots. This, along with the sweet onion relish on the side, gave these deep-fried morsels a Cornish pasty-style feel to them. 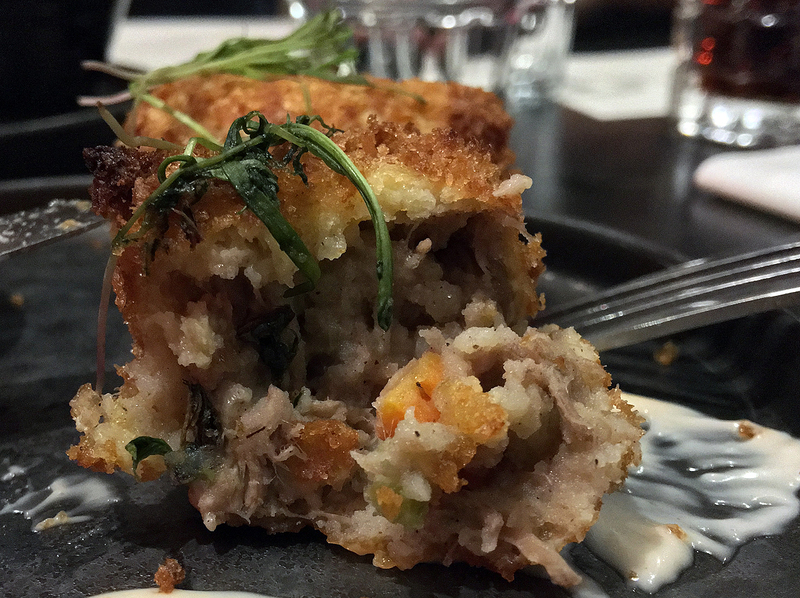 I accidentally typed ‘lamb pudding croquettes’ and I now want to make that typo a reality. The burrata only had moderate amounts of creaminess and elasticity in its mozzarella shell and was only somewhat chilled and milky on the inside. It still managed to make a lasting impression thanks to the addition of crunchy bread crumbs – the textural contrast between the carb crispies and processed cow juice was a tongue pleaser. 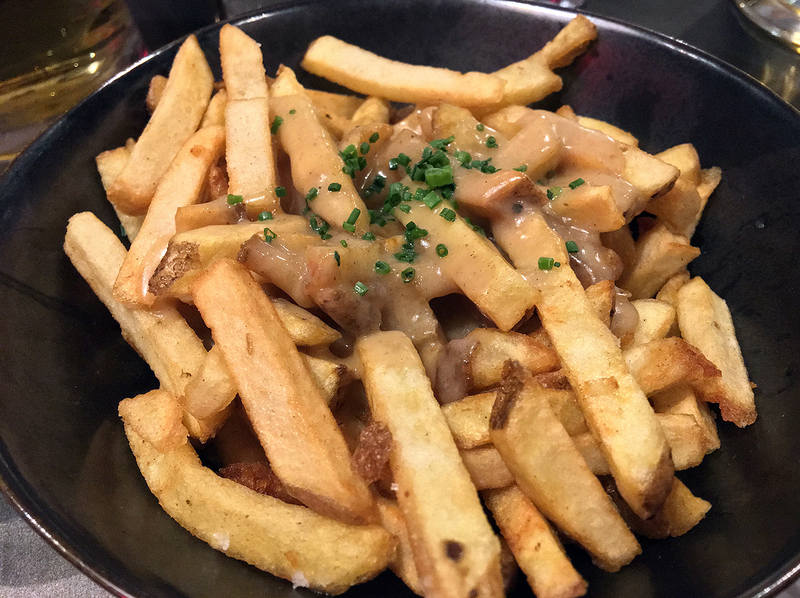 Fries topped with gravy and cheese sounds like a poutine-ish dream, but the floppy, reedy fries and scant cheese were unimpressive. The moderately sweet and moreish gravy went some way to righting this imbalance, but not far enough. In the end, this side felt more like a chore than a joy. Wafers of chicken skin were remarkable not only for their crispness and golden brown lustre, but also for their profoundly delicious taste. Its flavour was somewhere between that of moreishly browned roast chicken skin and cockle-warming chicken consommé. It’s rare to see an egg accompanying a chicken dish, but the yolk was a tad too hard – it needed to be runnier and richer to best compliment the chicken skin. 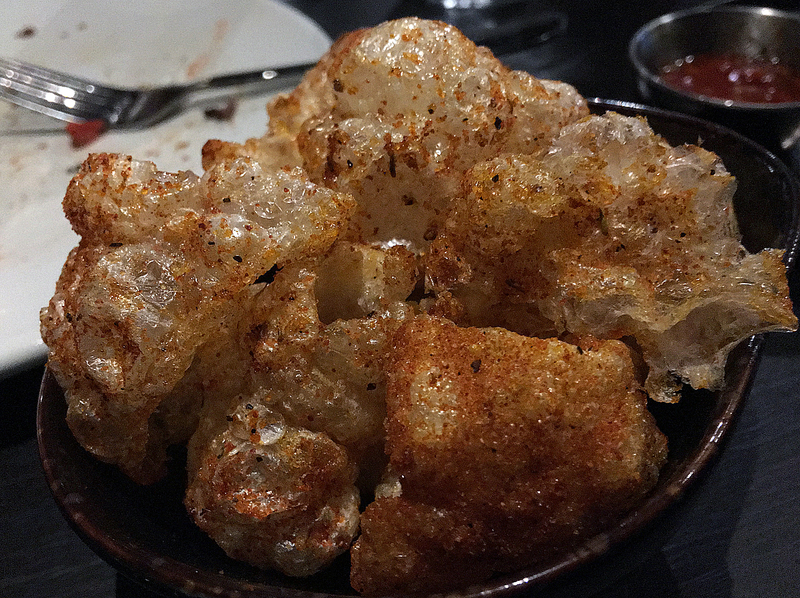 Even without the egg though, the chicken skin was truly delightful. What crossed the road first, the chicken or the egg? The best starter of them all had to be the thinly shaved rib cap. The weaponised buttery saltiness and fattiness of these exquisitely tender beef slices was so intensely enjoyable, it’s probably illegal. Almost looks like Kayseri-style pastirma. 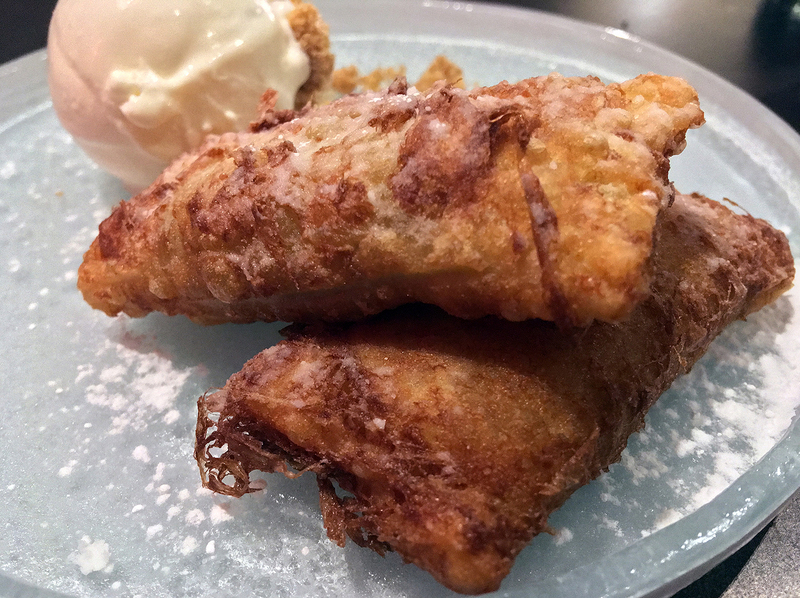 On paper, the deep-fried blueberry pie sounds like a homage to the infamous McDonald’s dessert. While the thin pastry was pleasingly malty, it was also oddly soft and floppy with a mildly sweet filling. It proved to be surprisingly dull, unlike the accompanying ice cream which was far better with its refreshing smoothness. Less of a pie, more of a Pop Tart that’s gone a bit soft in its old age. The only other dessert is a deconstructed cheesecake. 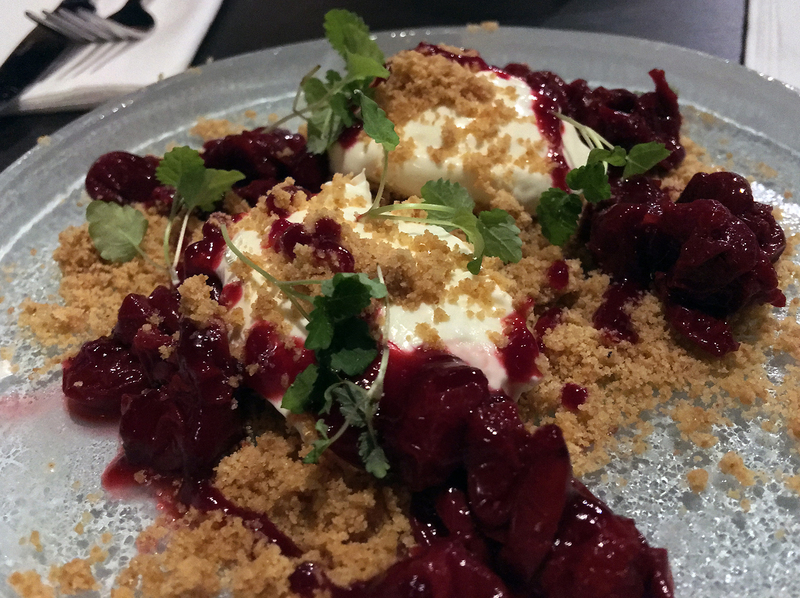 Smooth and sweet cream cheese – probably ricotta – went well with the sweet, squidgy cherries and crunchy, fine-grained crumb. While pleasing enough and suitably light following some of the relatively heavy mains and sides, its deconstructed nature is a tad clichéd and left me pining for a more traditional cheesecake. This review’s procrastination was brought you, in part, by The Lion King soundtrack. 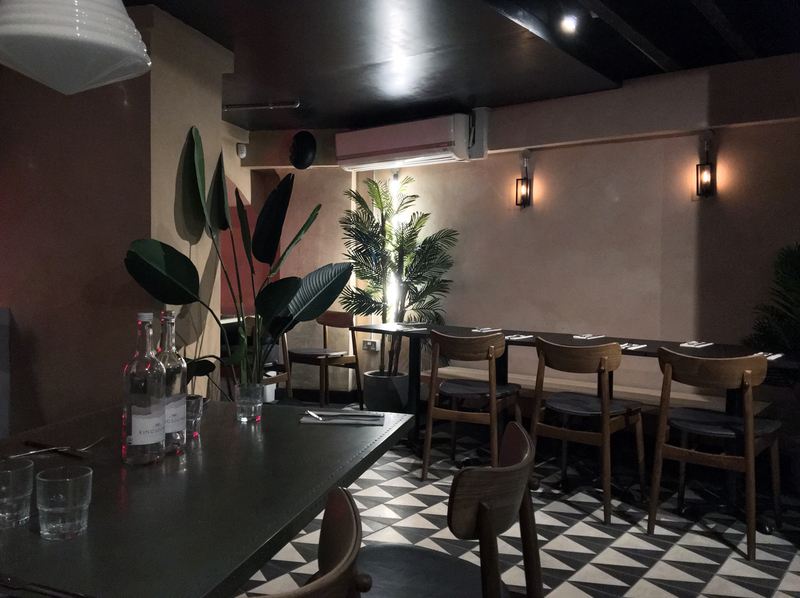 The path from street food trader to bricks-and-mortar restaurant is a well-trodden one for good reason. It weeds out the naff chaff from those operators with a fighting chance at success, giving them opportunities to hone their craft, workflows and supply chains. Burger and Beyond have emerged from this crucible with some of the best beef burgers in London – which is no mean feat given the competition. Although their non-bovine sandwiches are clearly second-best options for people who’ve chosen not to eat cows, that’s not their real problem. A far more pressing issue is that the ‘Beyond’ non-burger dishes – the crucial other half of their offering – is on shakier ground. 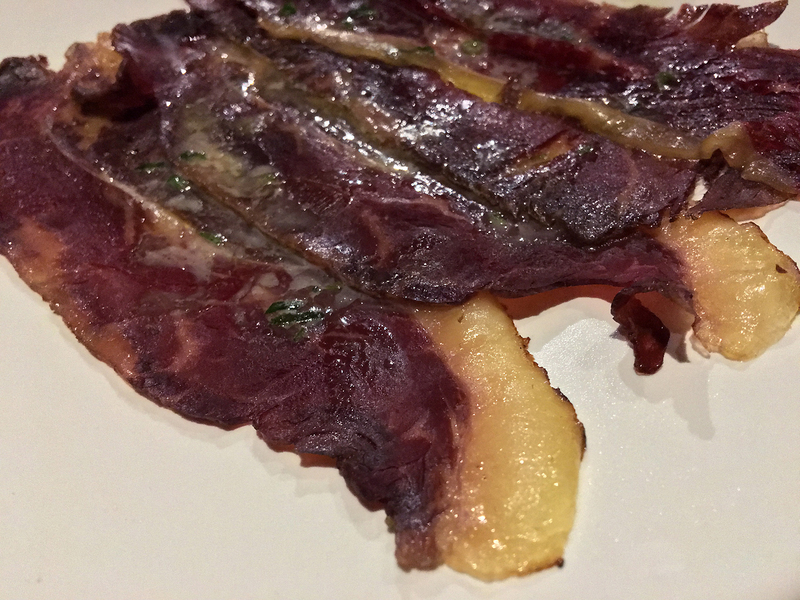 There are some real corkers here – namely the chicken skin and the beef rib cap – but a hit rate of just two is merely a sign of promise and isn’t fully realised potential. Still, that promise is immense – Burger and Beyond is a must-visit for any carnivore with an appreciation of the delightfully rich, deeply savoury sensations that only meat can provide. If Burger and Beyond can build upon this, they could be the next Honest Burger rather than the next GBK. One can only hope. Opening Hours: Monday-Wednesday noon-22.30. Thursday-Saturday noon-midnight. Sunday noon-22.00. Reservations? probably a good idea on weekends. Average cost for one person including soft drinks: £50 approx. (£35 if you order carefully and skip dessert). 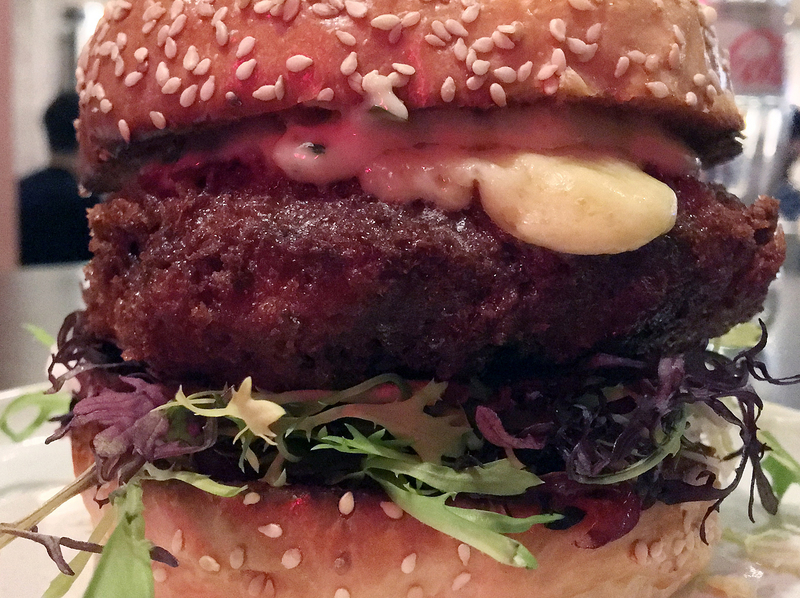 Tags: beef burger, black pudding, burger, burger and beyond, burrata, cheeseburger, cheesecake, chicken, crackling, croquettes, fries, london, mushroom, mushrooms, pie, restaurant, review, shoreditch. Bookmark the permalink.